Heavenly blog! : No. 674: Pastor David Yonggi Cho revealed as the villain , but the Pentecostal Charismatic Christians will probably be fooled again and nozzle down this when they do not live as Christians surrendered! No. 674: Pastor David Yonggi Cho revealed as the villain , but the Pentecostal Charismatic Christians will probably be fooled again and nozzle down this when they do not live as Christians surrendered! Pastor David Yonggi Cho revealed as the villain , but the Pentecostal Charismatic Christians will probably be fooled again and nozzle down this when they do not live as Christians surrendered! 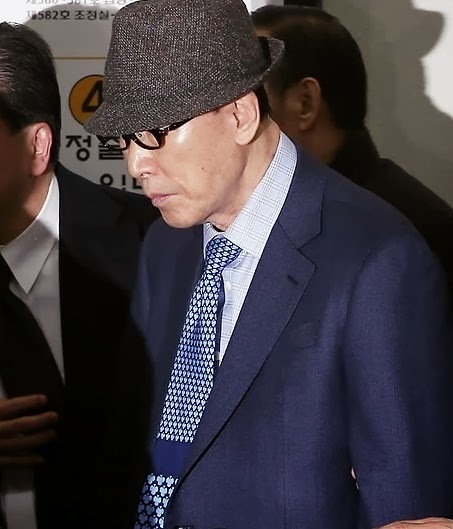 Photo of the deception and sentenced villain David Yonggi Cho after the verdict against him where he was convicted of fraud in many millions. It says in Scripture that one should not take yoked . Robert Schüller 's more a mixed product of Catholic New-age and worldly prosperity theology. His program broadcast from the Crystal Church in Los Angeles is an alienation from healthy evangelical preaching the word of the cross in the center . But I most want to stop by Dr. David Yonggo Cho . It is regrettable that the Pentecostal movement in Norway invite this man , time after time . In 1977, when he came to Norway first time , he prophesied with his former pastor with Housten , that 2 million Norwegians should be saved and 50 million in Europe in 10 years . This has not happened. Therefore, one can safely say that this man is false by God's own words. Jeremiah 28.9 . Furthermore preach Yonggi Cho about the fourth dimension which is very close to the same as Schüller preach about the possibility thinking. So what is the fourth dimension ? You can read it in his book, The Fourth Dimension , published by Logos publishers . To try to give a description of the occult teachings imparted here , which some column inches . Just preface makes it a little difficult to explain. For there Schuller writes : "Do not try to understand it , ( the fourth dimension ) Just start to enjoy it! That's true. It works. I tried it ." I will here try to explain simply what Yonggi Cho believes the fourth dimension : He believes the Holy Spirit is creative , but if we want, we can go into the fourth dimension , which animals , plants and all creation can not, and through our dreams and thoughts go in and take dominion over 1 ) God 2 ) Jesus ( word) and 3) the Holy Spirit. 2 ) Jesus by Rhema ( revelation ) is greater than the Logos (the word that is written in the Bible ) . 3 ) The Holy Spirit is the power that we can control who we want. Furthermore defends Yonggi Cho charismatic preachers in Pentecostal circles no matter what they preach and stand for. We must be clear to us that this is now happening in the Pentecostal movement , is apostasy from the faith in Jesus as the Word and our Savior , Redeemer and Lord. The prophet Jeremiah says it so eloquently in chapter 23 and verse 16: " Thus says the LORD of hosts, Hearken not to the words of the prophets that prophesy unto you : they ye vanity , they speak a vision of their own heart , not words mouth of the LORD . How could one taken up one after another as these false preachers are doing. It seems that it is Peter's words in 2 letter in chapter 2 verse 9 and the section as death. (Read for yourself) . Turn away from this, it is delusion, but ask them if it was possible for some of them to repent and come back to the Lord so He can heal their backsliding. Evangelist Jan Kåre Christensen . Excerpt from a post of the day 29/03/94 . Now Cho "reverse " up and says the following: No believer should own something that is his own . (state final ) . Here is the classic fallacy . From trying to own the most to not own anything . But unfortunately , all the Pentecostal Charismatic " famille " will forgive him and take him back , then they are seduced by and large it all. Do not see any light in the tunnel when it comes Pentecostal Charismatic Christians, here it is all black ! David Yonggi Cho . The head of the church Yoido Full Gospel Church in Seoul , today is the largest Pentecostal church and counts over 750,000 members. He is the senior pastor . But he is and remains a trickster , more is there to say about the matter. Having deceived approx. 80 Million and must repay 30 Million . And a sentence of three years imprisonment which he totally safe release when he is almost 80 years old and after all impunity before and have done a lot of "good" with what he has influenced such large crowds and thus do not have to zone . But who preach and shepherd he is a cheat , crook and as a manager and lead astray !